And so I wrote the following three blogs, but these were formulated before reading Hecht’s autobiography, in which I could see how Urwand, an aspiring screenwriter himself, could pounce on the imagined “collaboration” by moneybags moguls, while distancing himself from “Zionists”—and more, that Urwand failed to understand that Hecht was, for eight years, a strong ally, even a leader, to the “terrorist” Irgun, and that when Hecht referred to “Zionists” he referred solely to the Jewish Agency that was baring its neck to the British Empire that, I suspect, had no intention of giving up the Palestine Mandate and that wanted Moslem allies. Hecht was harshly critical of such Anglophiles as Chaim Weizmann, David Ben Gurion, Moshe Shertok, and Golda Meyerson (later Golda Meir), in the last section of A CHILD OF THE CENTURY (1954). 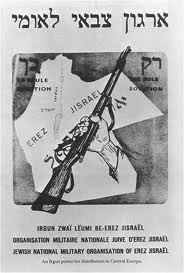 That the “moderate” Palestine Jews could have killed fellow Jews in the sinking of the Altalena and the murder of some of the fighting underground’s greatest heroes would seem to have broken Hecht’s heart, for he quickly wound up his book after this (intra-Jewish) world-shaking event. Ben Hecht, though clearly an ally to “the common man” even threw FDR overboard, as he recalled FDR’s betrayal of Holocaust survivors seeking a haven in Palestine (soon to be Israel), by making promises to the Nazified Ibn Saud that FDR would keep refugee Jews out of Palestine. 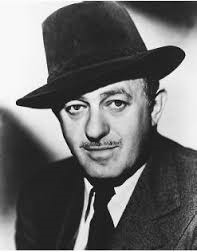 Make no mistake: Ben Hecht was no lover of Hollywood movies, which he wrote, he says, to replenish his ever dwindling coffers. Nor was he an admirer of the moguls, nor of the quality of the trash that Hollywood generally turned out, to the detriment of the high culture that Hecht embraced as a lifelong autodidact and genius. Hecht admits that his sympathy for Jewish life was aroused initially by his poor immigrant Yiddish-speaking relatives, and then his shock and horror that the Nazi massacre of European Jewry was proceeding apace without publicizing by “good Jews”, e.g. 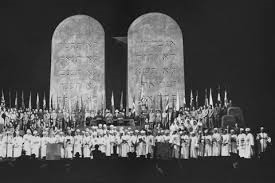 Rabbi Stephen Wise, the American Jewish Committee, B’nai B’rith, and the entire Jewish establishment. There were two American Jews who stood by him, as he tells it: Moss Hart and Kurt Weill (the latter a refugee from Germany of course). Ironically, Ralph Bunche made a secret visit to Menachem Begin in 1947, and was enthused about an enlarged Eretz Israel, in which there was room enough for all. But all that was before Bunche got the message from on high, and succumbed to his fellow persons of “color,” the classy Egyptians who courted him, unlike the vulgar Jews who assassinated Count Bernadotte, the latter a flunkey for Brits and antisemitic Americans in the State Department. For the Wiki biography of Ben Hecht see http://en.wikipedia.org/wiki/Ben_Hecht. But better still, read all the Hecht you can get your hands on, especially A CHILD OF THE CENTURY (1954). It will clear your head of cobwebs.